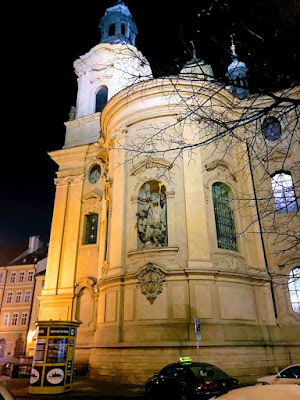 As I strolled around the Old Town of Prague on Thursday afternoon [24 January 2019] week, I visited the Church of Saint Nicholas, on the corner of the Old Town Square, Pařížská Street and Franz Kafka Square. Its beautiful green baroque towers and dome can be seen throughout the old town centre. 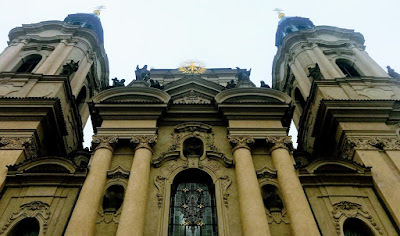 This monumental church was built in 1732-1735 to designs by Kilián Ignaz Dientzenhofer, on the site of an earlier 13th century Gothic church, also dedicated to Saint Nicholas. The church was the parish church of the Old Town and the meeting place until the Church of Our Lady Before Tyn the opposite side of the square was completed in the 14th century. After the Battle of the White Mountain in 1620, the church became part of a Benedictine monastery. The early mediaeval church was destroyed by fire, and the present church was completed in 1735, and its white façade decorated with statues by Antonin Braun. 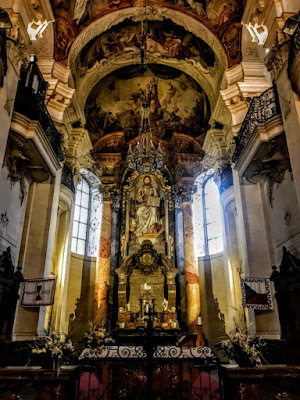 But just a half century after the church was completed, the Emperor Joseph II closed all monasteries not engaged in socially useful activities in 1781, the church was stripped bare and the interior decorations were sold off. The empty building was used as a granary for a while and then as a registry archive. The church returned to its original purpose in 1871 when it was used by the Russian Orthodox Church. During this Orthodox era, the splendid crystal crown chandelier, made in Harrachov glass works in northern Bohemia, was donated to the church by the Russian Tsar. 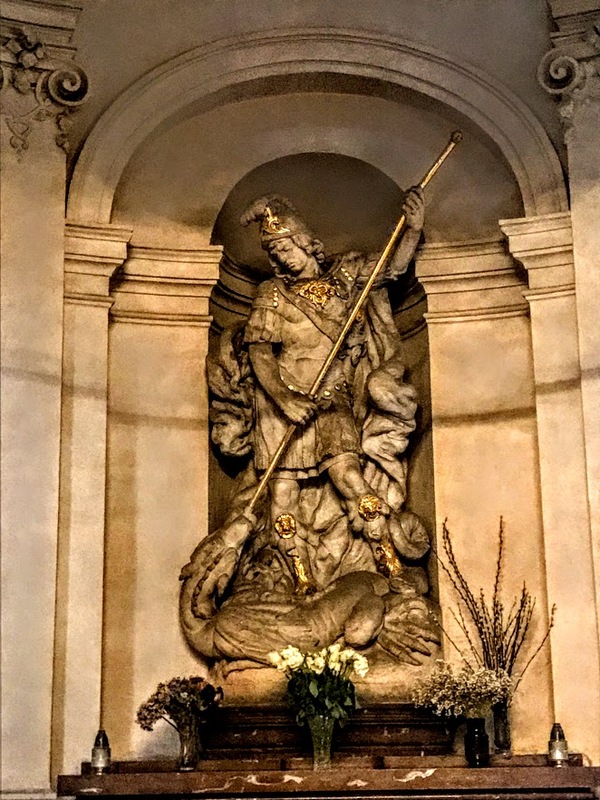 The 20th century brought new decorations with neo-baroque style paintings, statues, and a life-size sculpture of Saint Nicholas was placed in the outside niche of the church. 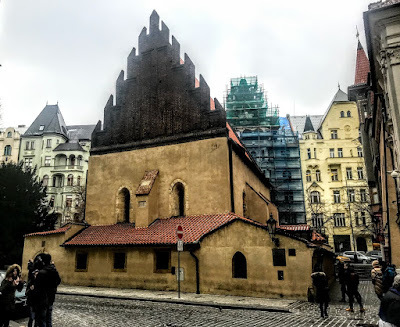 The Czechoslovak Hussite Church was founded here in 1920, reviving the legacy of the tradition of the reformer Jan Hus. 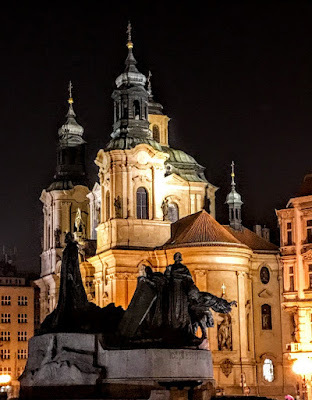 Since then, this has been the main church of the Czechoslovak Hussite Church and its Prague Diocese, and so it is often known as Saint Nicholas Cathedral. 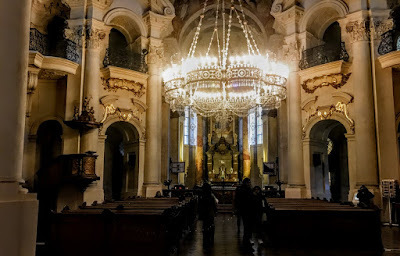 During the Prague uprising in 1945, the church was used by the Czech partisans as a hidden site for Radio Prague after the main radio building was attacked by the Waffen-SS. The Czechoslovak Hussite Church began when a group of priests in former Czechoslovakia separated the Roman Catholic Church after World War I. The church could be described as neo-Hussite, and contains Protestant, Catholic, Eastern Orthodox and national elements. It claims to have revived the traditions of to the Hussite reformers and acknowledges Jan Hus as its predecessor. The forerunner of the church was the Jednota or Union of the Catholic Czechoslovak Clergy, founded in 1890 to promote modernist reforms in the Roman Catholic Church, including as use of the local language in the liturgy and voluntary rather than compulsory clerical celibacy. The radical movement that resulted in the foundation of a new Church began in the Christmas season of 1919, when Christmas masses were celebrated in the Czech language in many Czechoslovak churches. The church was first formed in 1920 as the Czechoslovak Church by Dr Karel Farský (1880-1927), who became its first Patriarch and the author of its liturgy. It was well-supported by Czechoslovakia’s first president, Tomáš Garrigue Masaryk, a member of the Evangelical Church of Czech Brethren, the main Protestant denomination in what is now the Czech Republic. After the split, amidst the post-war atmosphere of anti-Catholic agitation and euphoria about Czech independence, the Czechoslovak Church’s membership increased rapidly. In the first post-war census in 1921, 523,232 people claimed to be adherents of this church in what is today the Czech Republic. By 1930, membership had grown to 779,672. At the beginning of the communist rule, the 1950 census recorded 946,497 members of the Czechoslovak Hussite Church. But under Communist rule, membership began to decline. 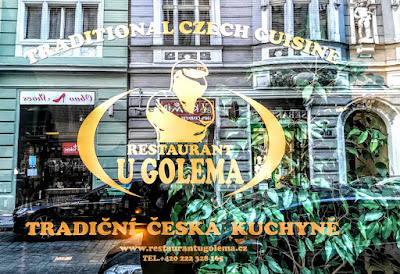 Membership today is estimated at between 100,000 and 180,000, mostly in the Czech Republic, with a smaller number in Slovakia. There are 304 congregations organised into five dioceses in Prague, Plzeň, Hradec Králové, Brno, and Olomouc in the Czech Republic and three congregations in the Bratislava Diocese in Slovakia. About 266 priests are in active ministry, of whom 130 are women. Candidates of ministry are prepared at the Hussite Faculty of Theology at Charles University in Prague. From the beginning, the Hussite Church sought relations with the Serbian Orthodox Church and the Old Catholic Church, but also showed tendencies to a rationalist and Unitarian theology until 1958, when it adopted a creed based on the Nicene Creed. 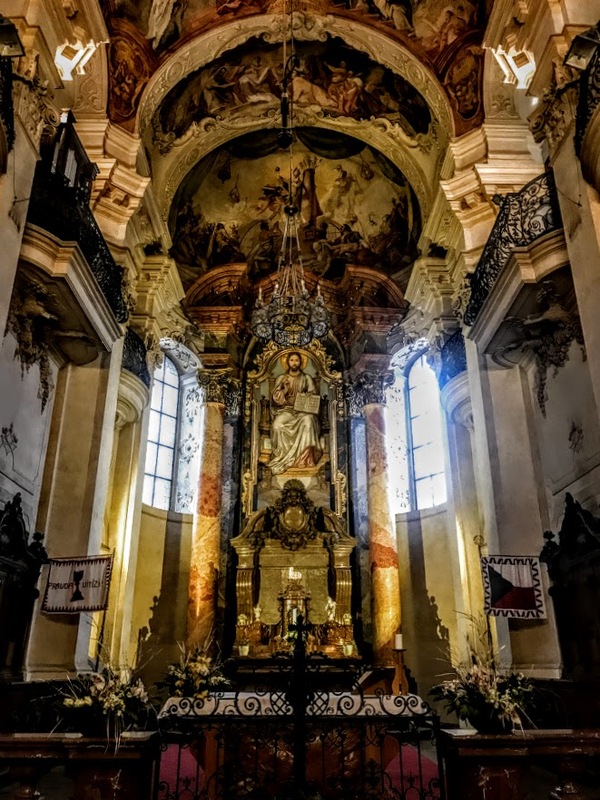 The church draws its teachings from the traditional Christianity expressed in Patristic writings or the work of the Early Church Fathers, the first Seven Ecumenical Councils, the work of Saint Cyril and Saint Methodius, and Reformation traditions, especially Utraquist and Hussite theology. The Czechoslovak Hussite Church recognises seven sacraments. Like some Lutheran and Presbyterian churches, it emphasises the freedom of conscience of individual believers, practices the ordination of women, and emphasises the equal participation of the laity in church leadership. 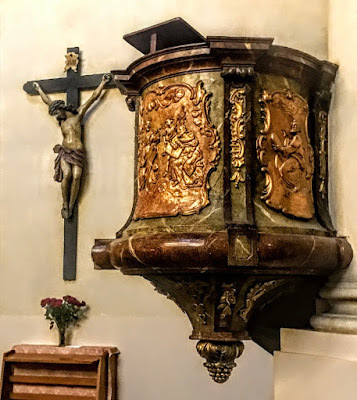 The liturgy has two forms that have much in common with the texts of the Roman Catholic Mass, but include elements of Luther’s German Mass and the Hussite tradition of the Utraquist mass. Although saints are not venerated, images of saints can be seen in church decoration. In imagery used by the church, the chalice plays a major role, usually depicted in red, as it was used in the 15th century as a battle standard on the flags of the Hussites. 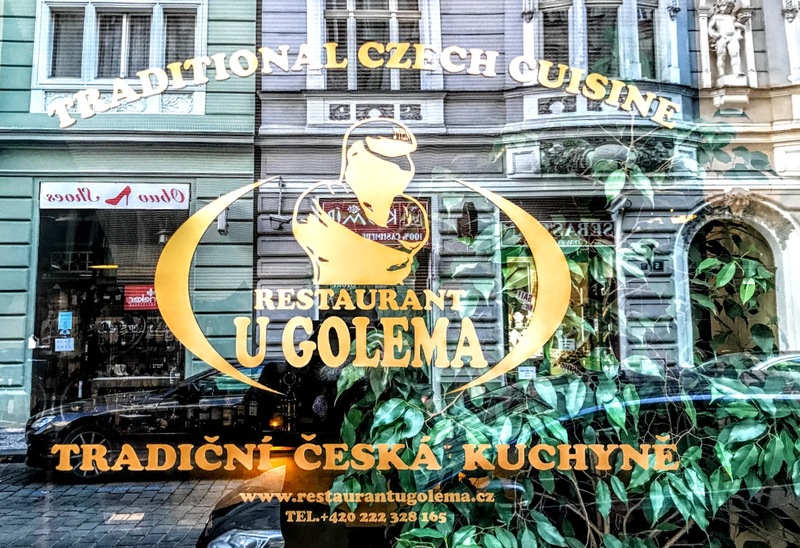 Ecumenical relations are cordial, but sometimes they have been strained with the Roman Catholic Czech hierarchy. When the first woman to become a bishop in the Czechoslovak Hussite church, Jana Šilerová, was elected 1999, the Roman Catholic Archbishop Miloslav Vlk warned election would damage ecumenical relations. But the Roman Catholic Church distanced itself from his remarks, and Roman Catholic representatives attended her consecration the following year. Bishop Jan Schwarz was the seventh Patriarch of the Czechoslovak Hussite Church (2001-2005). During his time in office, the church was divided between rival factions, with some refusing to accept his patriarchy and threatening division. He resigned when he was called before the church's Episcopal Central Council in 2005, and later joined the Religious Society of Czech Unitarians. The present, eighth patriarch, Bishop Tomáš Butta, was elected in 2006. 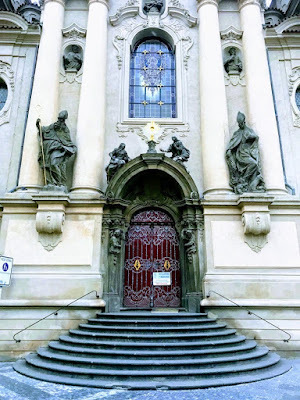 The church is a member of the World Council of Churches, the Ecumenical Council of Churches in the Czech Republic, the Conference of European Churches, and the Leuenberg Community of Churches. The church faces onto the Old Town Square and the Jan Hus Memorial. This huge monument depicts Hus with Hussite warriors and Protestants who were forced into exile 200 years after Hus in the wake of the lost Battle of the White Mountain during the Thirty Years’ War, and a young mother who symbolises national rebirth. The monument was so large that the sculptor, Ladislav Šaloun, designed and built his own villa and studio to complete the work. It was unveiled in 1915 to mark the 500th anniversary of Jan Hus’s martyrdom. Jan Hus (1369-1415) was inspired by the teachings of John Wycliffe and was a key forerunner of the later Reformation in the 16th century. He criticised religious and moral decay in the Catholic Church, believed the Mass should be celebrated in the local language, rather than in Latin. Hus was finally condemned by the Council of Constance and burned at the stake in 1415, leading to the Hussite Wars. To the people of Bohemia, Jan Hus became a symbol of dissent and national resistance, and later became a symbol of opposition to Habsburg rule. During Communist rule, sitting at the feet of the Jan Hus memorial became a way of quietly expressing opposition. The memorial was restored in 2007. Saint Nicholas Church can be visited every day except during Mass on Sundays. It is also a very venue for concerts of religious and classical music. the streets of Prague at night? 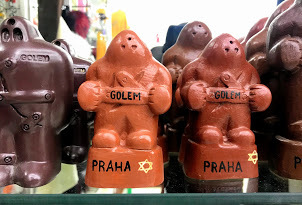 The Golem of Prague is difficult to describe. He is to be seen everywhere, yet he is said to be hidden in the rafters of a synagogue. Her lacks wisdom and intelligence, yet he is part of kabbalah and Jewish mysticism. He has no mind of his own, yet everyone seeks him out. You are unlikely to have heard of him unless you are unaware of Jewish folklore or the legends of Prague. Yet souvenir statues of him are on sale throughout the Jewish Quarter and the Old Town. Is he a cross between the Gingerbread Man and Frankenstein’s monster? He was never a person, yet he is one of the most famous personalities to have walked the streets of Prague. Indeed, you may ask, did he ever exist? During the reign of the Emperor Rudolph II in the 16th century, Rabbi Judah Loew ben Bezalel is said to have been endowed with supernatural gifts that he combined with the four elements: fire and water were represented by his assistants, air was represented by the rabbi himself, and earth was found in the Golem. He brought these together bring to life the Golem, a sculpture moulded from the mud of the riverbed in Prague. Rabbi Loew created the Golem according to the kabbalah, which specified he should be made of clay from the banks of the Vltava River. Following the prescribed rituals, the giant Golem was created, and came to life when his maker recited special incantations in Hebrew. After the incantations, the Golem awoke but would do the biddings only of his maker, which included protecting the Jews of the Ghetto. Rabbi Loew placed the Hebrew word emet (‘truth’) on the Golem’s forehead. His purpose in life was to protect the Jews of Prague against anti-Semitic violence. To carry out his task, his master gave him a special necklace, made of deer skin and decorated with mystic signs, that rendered the Golem invisible. The Golem, who was called Josef and known as Yossele, patrolled the ghetto. It is said he could make himself invisible and call up spirits from the dead. At first, the Golem was indistinguishable from ordinary people. He was diligent and hard-working, helping the Rabbi in his household and in the synagogue. The only thing he lacked was the ability to speak. But the Golem was regarded as a dumb klutz because he was literal-minded, could not speak and had no sechel or intellect. He was large and shapeless, and he lived with a clay tablet in his mouth that was removed on Saturday because it was the Sabbath. But there is a dark side to the legend. As the Golem grew stronger with each incantation, he also grew increasingly violent and is said to have gone on a murderous rampage. Some say this was due to a broken heart, but did he ever have a heart? The Golem grew stronger and stronger. Instead of heroic deeds, he became more-and-more uncontrollable and destructive. 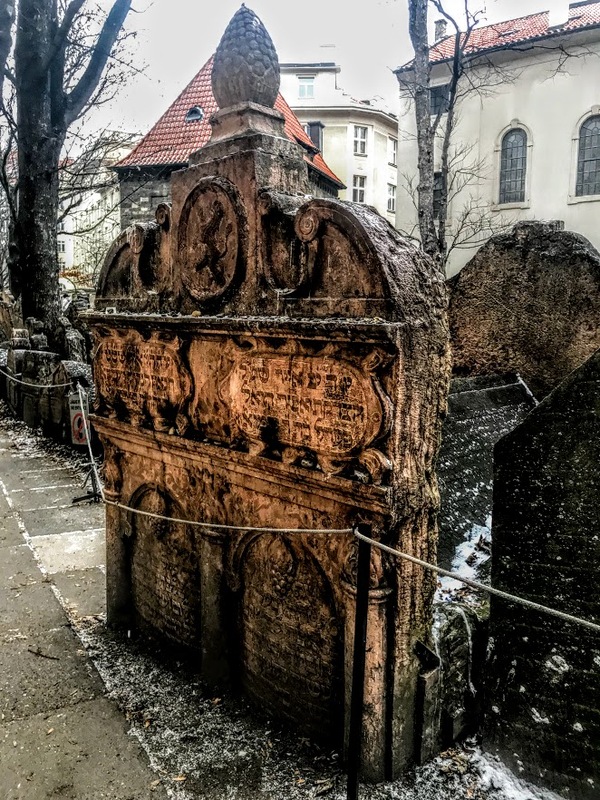 Rabbi Loew was promised that anti-Semitic violence would end in Prague once he destroyed the Golem. One day, the Golem was found uprooting trees and destroying the rabbi’s home while the rabbi was in the synagogue singing Psalm 92. The rabbi rushed out to remove the tablet from the Golem’s mouth. Fearing the Golem could fall into the wrong hands, Rabbi Loew smeared clay on the Golem’s forehead, turning emet into met, so that the Hebrew word for truth became the Hebrew word for death and life was taken out of the giant’s body. Rabbi Loew put him to rest in the attic of the Old-New Synagogue. The rabbi then returned and continued to sing Psalm 92 … and so, it is said, the Old-New Synagogue in Prague is the only place in the world where this psalm is sung twice. Rabbi Loew died in September 1609, at nearly 100. A Jewish mystic and philosopher who was a leading scholar of the Talmud and kabbalah and wrote at least 22 books, he was known widely as the Maharal, a great sage. For hundreds of years, entry to the attic of the Old-New Synagogue was barred and the stairs to the attic were removed. 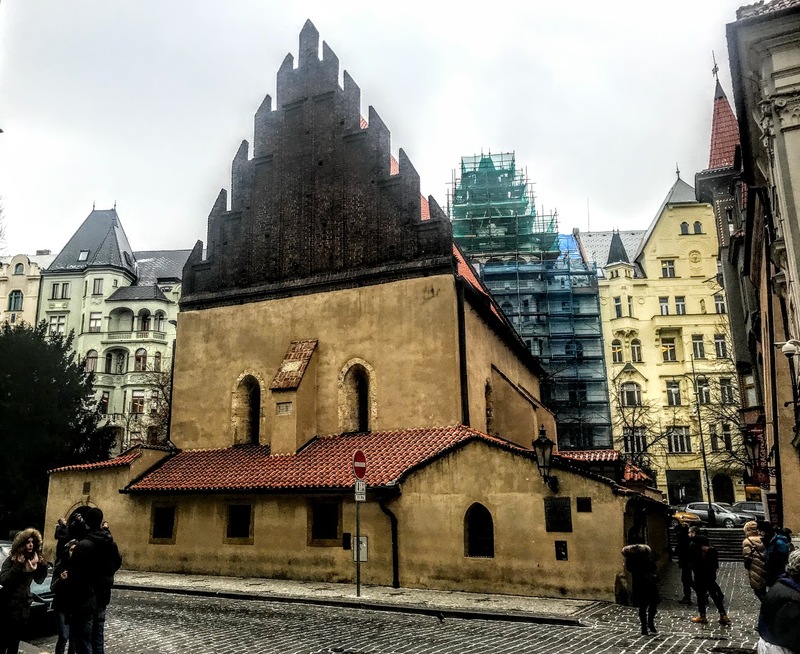 Some say, however, that Rabbi Loew’s son brought the Golem back to life, and may still be protecting Prague today. During World War II, it was rumoured that Nazi soldiers broke into the synagogue, and Rabbi Loew’s Golem ripped them apart, limb by limb. They say the Golem, with his glowing eyes and supernatural powers, is lurking once again in the attic of the Old-New Synagogue, waiting to be called forth in times of crisis. Another rumour says that in the 1990s, the synagogue’s shamash or attendant, a man called Josef who shared the Golem’s first name, had been telling visitors he was the Golem’s great-grandson. The synagogue receives dozens of requests each year for visits to the Golem’s attic lair, but each request is politely declined. I visited Rabbi Loew’s grave yesterday [24 January 2019] and, following Jewish custom, I placed a prayer on paper and a stone near his grave. 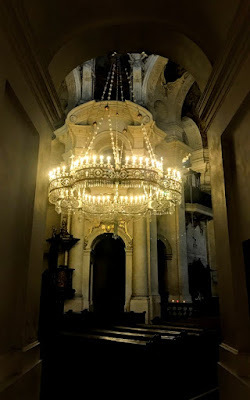 I visited the Old-New Synagogue too, without climbing to the attic, and I have wandered through the Jewish Quarter by day and by night throughout this week. But I have yet to see or meet the Golem.